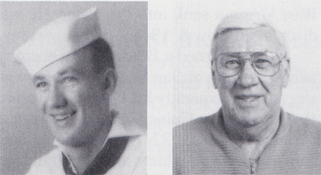 Albert F. "Pete" Peterson, Jr., Seaman l/c, born Dec. 13, 1921, Denver, CO, and enlisted in the USN Jan. 17, 1941. After boot camp at San Diego, he reported to USS West Virginia and was assigned to the 6th Div. as a powderman on the #3 turret. He was leaving to go on liberty when the Japanese attacked. Pete and nine other sailors dove off the ship when it started sinking and swam to Ford Island. He was the seventh man off the ship, but the first to reach Ford Island. He says, "I never liked swimming, but could have beat Esther Williams that day." After the attack, Pete helped clean-up and picked casualties from the water. He was then assigned to the Anti-Aircraft Training Center, Waianae, Oahu and discharged from NAS Pasco, WA, Nov. 6, 1945. Pete and his wife, Sally, live in Denver, CO, where he is retired from the post office. They have four children, 10 grandchildren and one great-grandchild. Hobbies are baseball, volleyball, golf, automobiles and bowling.